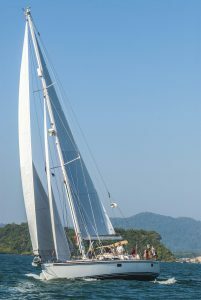 Our favourite picture of Adina – leaving Thailand for Sri Lanka with all of her new sails hoisted. Many moons back our friend Chris Brooks sailed single-handed around Britain in a dinghy. Chris used a YellowBrick Tracker (now called a YB Tracker) so people could follow his progress; a YB Tracker is a satellite-enabled GPS device which, when requested, sends out a signal resulting in your exact position being shown on a map which anyone can view on a website. We followed Chris every step of the way. His YB Tracker was hugely addictive; we’d sit refreshing the website many times hoping for another update. The frequency of that update is chosen by the person who owns the tracker – it can be set to go off automatically at whatever time period they choose or they can send a position whenever they like. We told Susie’s parents about Chris and his adventure and Susie’s mother was soon addicted. Chris had no idea he had a retired follower from Northwood, Middlesex! Roll on to Christmas morning 2012 and we are at Susie’s parents’ house. Our present awaits under the tree and when opened reveals a clue in the form of a yellow lego brick – her parents had bought a YB Tracker for Adina! Debate still rages whether this kind gift was given in order to enable them and others to follow us or rather for them to check up at any time on the location of Adina’s precious cargo, their daughter. The YB not only provides our longitude and latitude position but also information like a snapshot average speed over ground, course, height above sea level, temperature etc. When we started our adventure the position indicator would state “Last known position of Tom Partridge” and feeling this was a bit morbid we asked for the wording to be changed and nowadays a simple symbol is used to indicate our position. The eagle-eyed will also note we often seem to be sailing above sea level – it would be too easy to state we sometimes fly along. The two of us wondered if Adina’s YB Tracker would become as addictive to anyone as Chris Brooks’ had been to us…. Introducing Malcolm Keenor! Malcolm has diligently tracked our trip since the day we left the Hamble and logged our progress on a spreadsheet, ping by ping. From time-to-time he sends us a report of the highlights. When we round headlands or corners we have to make sure we send a manual ping as if left on automatic mode our track risks showing us sailing right over a headland. We started becoming mildly paranoid about not forgetting to ping the YB Tracker, fearing we’d be in trouble with Malcolm for being lazy. Many a time the expression “ping the tracker” is called out in Adina’s cockpit. The tracker is usually spot on to the degree that when Charlie and Nicola Beausire joined us in Palma, Mallorca, in 2013 they used it to locate the boat in the marina and walked right up to Adina, no problems. We were sitting thinking they were a bit late and it was strange they hadn’t called us when we looked up and there they were! 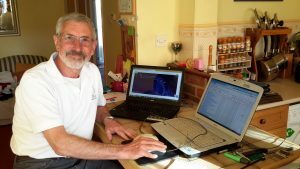 Malcolm sent us our full-time circumnavigation report which we wanted to share. What will be interesting will be for us to add up all the miles we sailed per our hand-written log book and compare them to the figures below; as the tracker only goes off every so many hours it misses any deviations in our course as it only does point-to-point measurements. 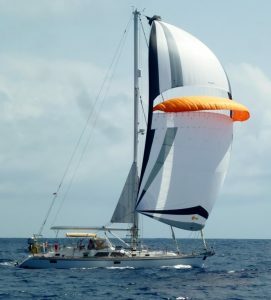 Adina crossing the South Atlantic flying her parasailor. It’s interesting looking at the speeds – the YB tracker simply shows a snapshot in time. 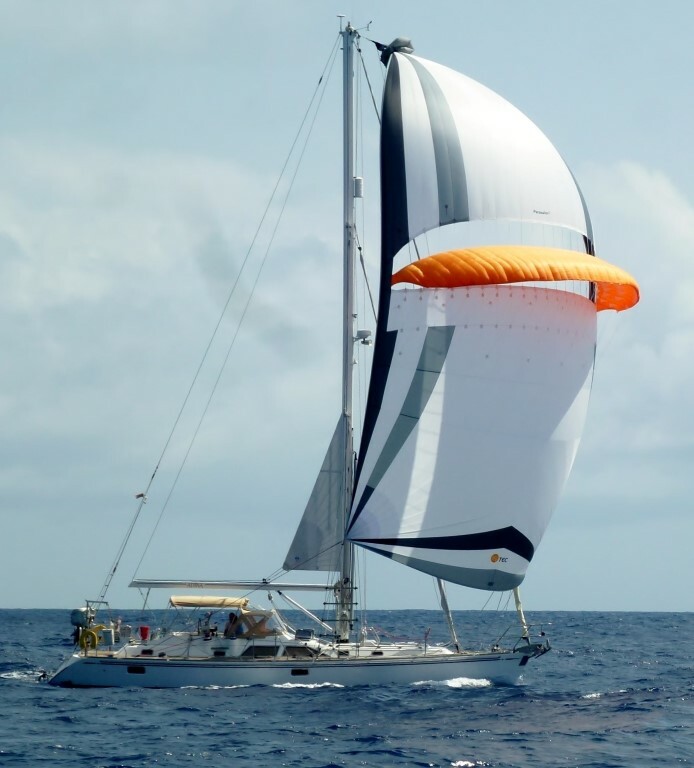 Adina regularly goes at speeds of 7 to 8 knots in the right winds and has often done speeds in excess of 10 knots. Our actual top speed was recorded by Susie surfing Adina down a wave off the Portuguese coast at 17.4 knots. Malcolm logged our fastest speed as going from Singapore to Indonesia – that was crossing the Singapore Straits and avoiding lots of shipping traffic! On a serious note, one of the advantages of the YB Tracker is that it is also a helpful device in that back home we have Susie’s brother, Stephen, who can log into our account and ping it from his computer to find out where we are should we ever get in trouble. The YB Tracker has been one of our best acquisitions and the website statistics show it is by far the most viewed page. Malcolm Keenor – thank you! “Dear Suzie & Tom, Congratulations on your point to point circumnavigation of our world (earth!). It would have been lovely to have been with you when you entered Prickly bay yesterday morning. Well done indeed!